The Los Angeles Dodgers will play an NLCS Game 7 Saturday and try to make another trip to the World Series. 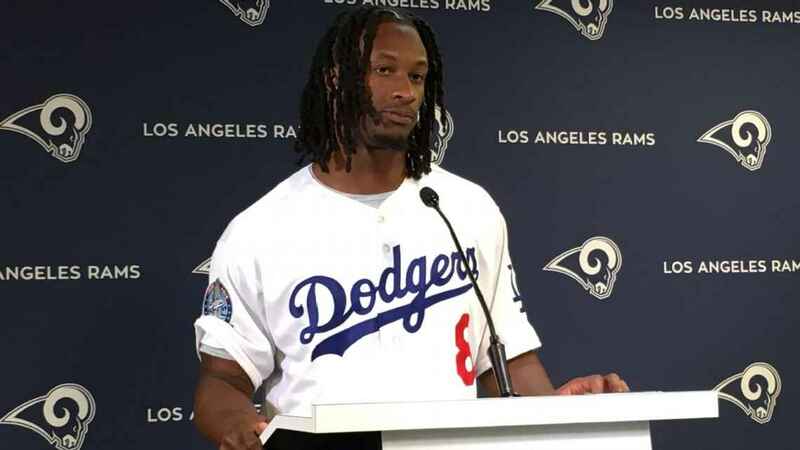 If Todd Gurley II has his way, the Los Angeles Rams won’t be far behind with their own deep postseason run. While there’s a long way to go, the Rams are doing their part as the only remaining undefeated team in the NFL. They’ll face the 1-5 San Francisco 49ers on Sunday at Levi’s Stadium. 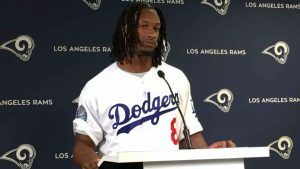 The Rams have a 99.7 percent chance of making the playoffs, according to ESPN’s NFL Football Power Index, and a Super Bowl run is certainly within reach, along with several other accolades for the 24-year-old Gurley, the defending NFL Offensive Player of the Year, who is on pace for an MVP season. The Rams’ offense is ranked first in the NFL, averaging 464.3 yards per game. Gurley leads the league in rushing with 623 yards and 9 touchdowns, averaging 103.8 yards per game. Last Sunday against the Denver Broncos, he rushed for a career-high 208 yards and two touchdowns and also caught two passes for 17 yards, much to the delight of fans who have him on their fantasy teams. But coaches and teammates won’t let Gurley off that easy. A large part of their success is due to their star running back, who signed a four-year, $60 million extension before the season and has the ability to run, catch passes and block. Against the Broncos, the Rams faced third-and-10 from their 42-yard line in the third quarter, leading 13-3, when safety Darian Stewart blitzed and Gurley leveled him, allowing Jared Goff to complete a 14-yard pass to Woods. The series eventually resulted in a 1-yard touchdown run by Gurley. Previous Previous post: Can Anthony Davis go from great to greatest?